Originally, the Bureau was formed to help farmers improve their production practices. 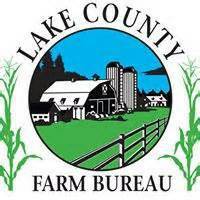 Today, the Lake County Farm Bureau® serves both rural and urban people who are interested in the production of a plentiful and safe food supply. Nationally the organization boasts nearly four million member families. The Lake County Farm Bureau's® goal is to maintain an organization through which rural and urban people can think, act and work together to strengthen agriculture's role and influence. It exists to provide programs and services for each and every member. We hope you will find this web site to be a useful tool as we constantly update it for your benefit. Please feel free to visit the many valuable links we have provided that can aide in business, education and personal use. FARM BUREAU® and FB® are registered service marks owned by the American Farm Bureau Federation. More information about the American Farm Bureau Federation can be found by clicking below.